The whole family will enjoy the delicious, sweet and savory taste of steak tacos that use this extremely addictive carne asada marinade and are grilled to perfection on a charcoal grill! Place skirt steak in a resealable gallon-sized bag. Whisk together the olive oil, soy, scallions, garlic, lime juice, cumin, brown sugar, and fresh cilantro in a small bowl. Pour marinade over the steak and marinate at least one hour, but best overnight. Grill over high heat for about 5 minutes on each side, until the internal temperature reaches 140°F in the thickest part of the steak. Take it off the heat and cover with foil, let rest for 5-10 minutes. Slice against the grain and serve with tortillas and your favorite taco toppings. 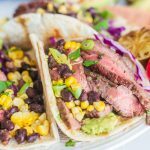 Skirt Steak Tacos Recipe found on https://thissillygirlskitchen.com/skirt-steak-tacos/ *All nutritional information is approximate and may not be 100% accurate. Please consult a nutritionist for more specific information.